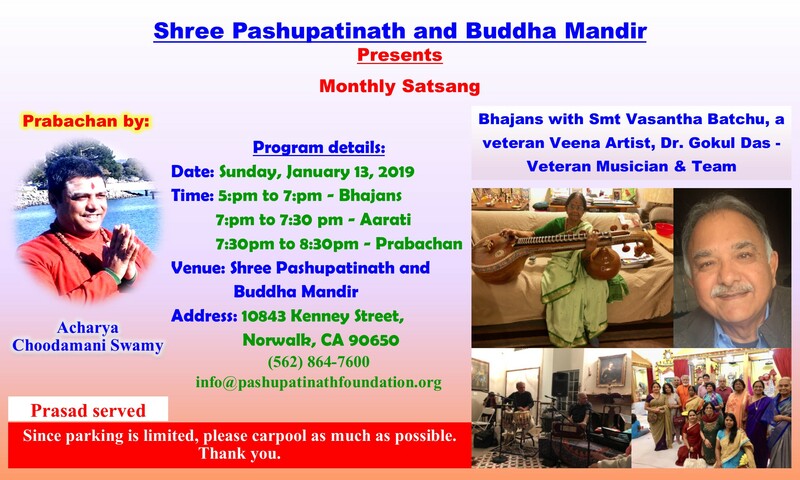 It is our great pleasure to invite you and your friends and family to a very special Bhajans with Smt Vasantha Batchu, a veteran Veena Artist, Dr. Gokul Das -Veteran Musician & Team, and Prabachan by our Acharya Choodamani Swamy from 5:00 PM-8:30 PM on Sunday, January 13, 2019. Please come with family, friends, and relatives to attend this special event. Prasad will be served. Feel free to contact our office (562-864-7600) should you have any questions or concerns. Also contact us if you would like to sponsor this event or any other future events. Thank you very much for your invaluable participation in advance. It is our great pleasure to invite you and your family to attend Durga Puja at Shree Pashupatinath and Buddha Mandir in Norwalk. Please join us to recite Durga Paath and offer Jamara Puja every morning from 7:00-9:00 AM and Devi Bhagwat Puran every evening from 7:00-9:00 PM. Feel free to contact us if you would like to sponsor the Durga Puja this year. Join other community members for a special talk (Prabachan) given by Swami Shri Gopal Sharan Devacharya Ji Maharaj from 7:00 PM-9:00 PM on Sunday, April 1, 2018 at Shree Pashupatinath & Buddha MANDIR in Norwalk, California. 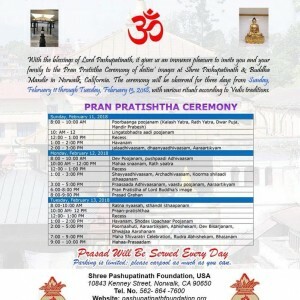 With the blessings of Lord Pashupatinath, it gives us an immense pleasure to invite you and your family to the Pran Pratistha Ceremony of deities’ images at Shree Pashupatinath & Buddha Mandir in Norwalk, California (10843 Kenney Street, Norwalk, CA). The ceremony will be observed for three days from Sunday, February 11 through Tuesday, February 13, 2018, with various rituals according to Vedic traditions. 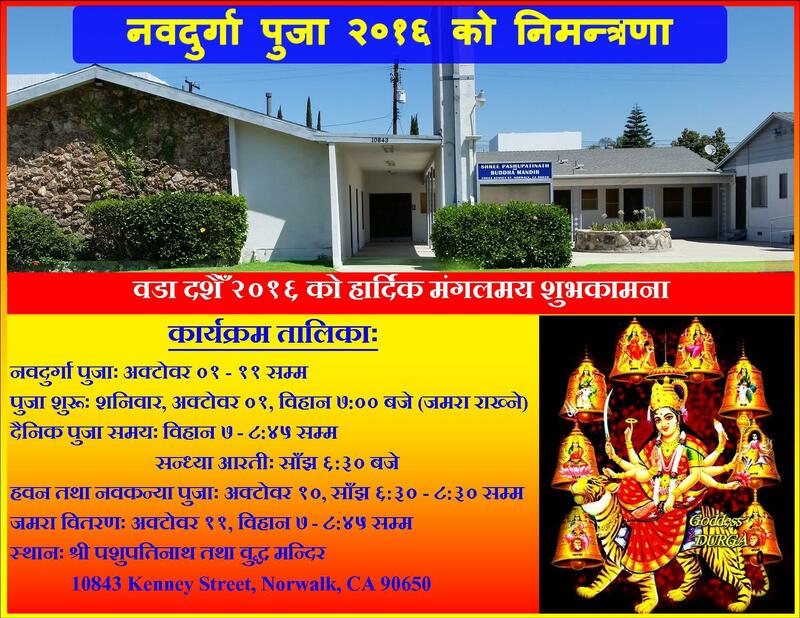 It is our great pleasure to invite you and your family to attend Durga Puja at Shree Pashupatinath and Buddha Mandir in Norwalk. 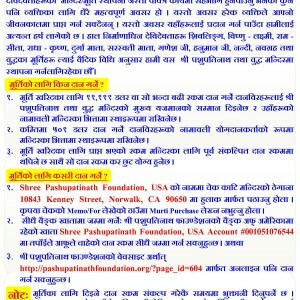 Please join us to recite Durga Paath and offer Jamara Puja every morning from 7:00-8:45 AM. Feel free to contact us if you would like to sponsor the Durga Puja this year. We at Shree Pashupatinath Foundation, USA have initiated process to procure the murtis (images) of deities and install them in our property located at 10843 Kenney Street, Norwalk, CA 90650. We have been able to come to this stage because of your financial contribution, active involvement, and continued pledge and support. After collecting opinions from community members and pundits, we have decided to install the Shivalinga, images of Vishnu-Laxmi, Ram-Sita, Radha-Krishna, Durga, Saraswati, Ganesh, Hanuman, Nandi, Navagrahas and Buddha. Now, we are looking for sponsors to bring the murtis, which are being carved, to the temple. Therefore, we invite all our community members to sponsor a murti (or murtis) and grab this lifetime opportunity to be remembered forever. Your participation and involvement is very important to us. Thank you very much in advance for your valuable contribution. 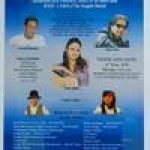 We would like to inform you that we are organizing a dinner function followed by real live Nepali concert program and dance party with our famous artist Harish Matema,Raju Lama and Anita Subba in Bombay Garden Restaurant,Artesia,CA. 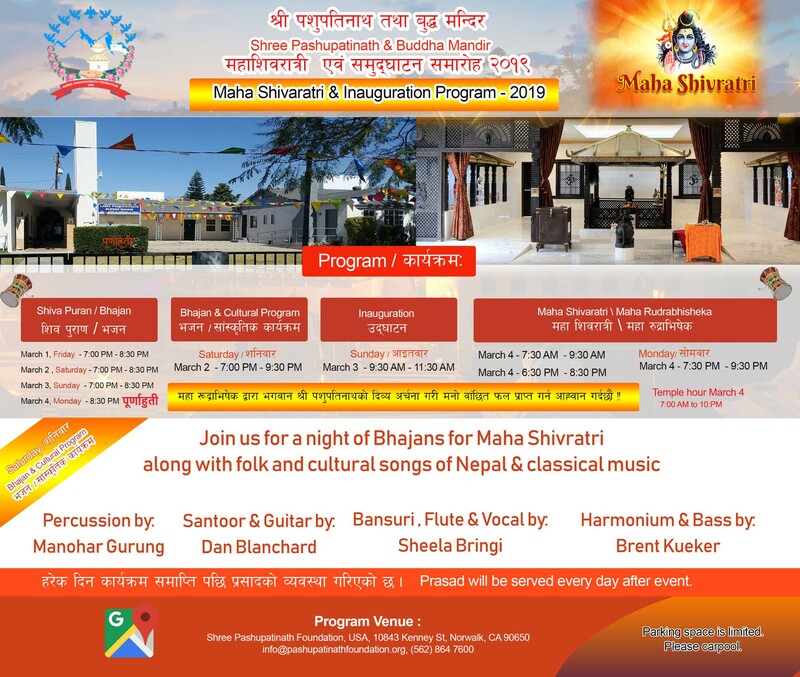 please help to make this program successful and invite as many people as you can. 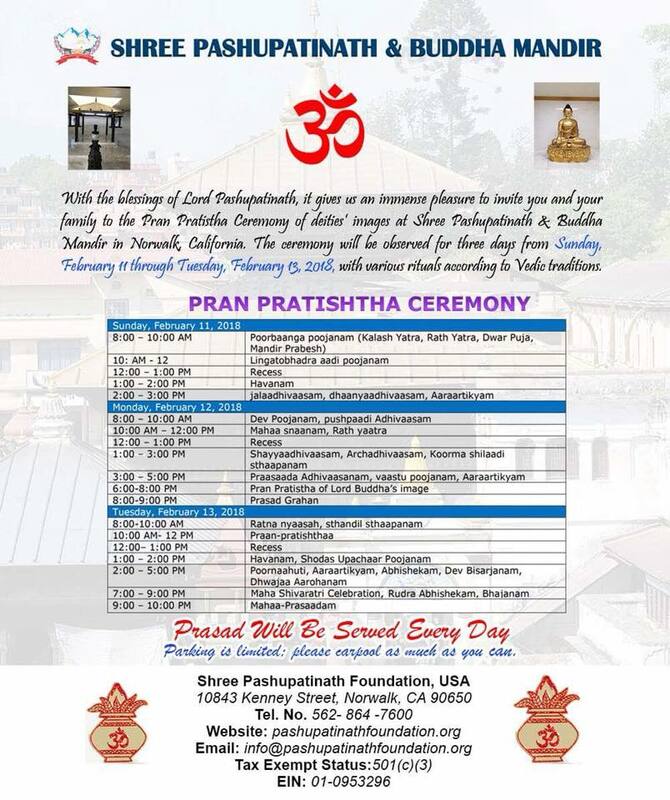 The benefit of this program will be hand over to Shree Pashupatinath Foundation USA. It gives an immense pleasure to inform you that Guru Dr. Chintamani Yogi ji has agreed to spend some time with the officers of Shree Pashupatinath Foundation, USA on Sunday, May 30, 2010. If you have any questions, please call me at: 714-395-0292. Thank you everybody in advance, for your participation. It will be a great Interaction Program with Dr. Yogiji.